As if we needed another reason to change our diet. 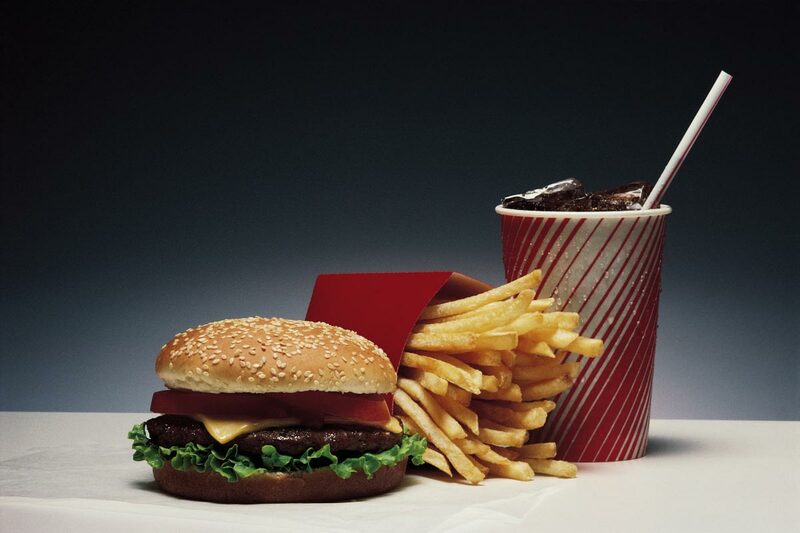 Scientists are now saying that washing down that cheeseburger with a cold soda changes the way your body burns fat. In analyzing the direct impact that sugary drinks have on body metabolism when paired with a high-protein meal, researchers observed an amplified effect in weight gain. Not only were these meals typically calorie-rich, but the combination also slowed down the fat-burning process all the while not adding anything to satiety. In essence, the typical American diet makes us fatter because we feel hungry easier while not burning anything off. This small study, published in BMC Nutrition, concluded that around a third of the additional calories found in sugary drinks were not spent while reducing metabolism. This, the study’s authors said, “primed” the body to store more fat. The effect was particularly evident when the drinks were paired with a protein-rich meal. On average, metabolism was slowed by eight percent when a sugar-sweetened drink was taken with a meal that was 15 percent protein. This rate was further exacerbated when protein content was increased. Taking a 30 percent protein meal with a sugary drink, for example, decreased metabolism by 12.6 percent. The researchers also noted that while sugary drinks increased the amount of energy used to metabolize meals, the increase was not enough to even out the additional calories found in the drink. For the purposes of this study, the researchers recruited 27 healthy-weight adults (13 male, 14 female) who were, on average, 23-year-olds. Participants were given special meals and placed in special isolated rooms called “room calorimeters”. The rooms were calibrated to measure the oxygen and carbon dioxide levels as well as the temperature and air pressure. These data would allow the researchers to determine how specific meals affected the participant’s metabolism, including how many calories they burned and how fat, protein, and carbohydrates were broken down. Participants spent two 24-hour periods in these rooms. Each period began at 4 p.m., with dinner being served at 5 p.m. There was then a fasting period until breakfast the next morning. During one of their stays in the room calorimeter, participants were served breakfast and lunch meals that contained 15 percent protein. Each meal was paired with a sugary drink sweetened either with sugar or artificial sweetener. If the sugar-drink was served at breakfast, the participant had the artificially sweetened beverage at lunch and vice versa. Participants were observed for four hours after each meal. During the other time that they stayed in the room, participants were served a breakfast-lunch combo with meals that contained 30 percent protein. Consolidating the data, researchers said that the fat-burning ability of participants who took a sugary drink decreased by eight percent. Additionally, these same drinks added more calories to the meals without making the participants feel fuller for longer. These findings “provide further insight into the potential role of sugar-sweetened drinks — the largest single source of sugar in the American diet — in weight gain and obesity,” Casperson concluded.